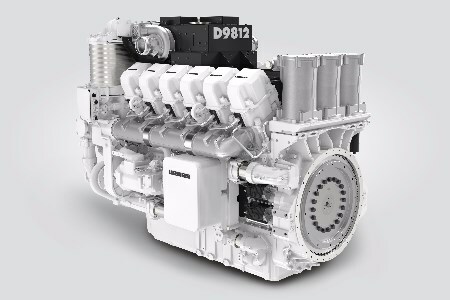 Liebherr has developed the D98 diesel engine series, an engine that is able to face even the most demanding needs of the mining industry. The new product range will include three different cylinder variants: a V12, a V16 and a V20. At this year’s MINExpo in Las Vegas, the first cylinder configuration, a V12 engine with the power output rating up to 2013 kW, was introduced. Liebherr designs and develops the new D9812 diesel engines in Colmar, France. The engine ensures high productivity at lower costs. Its architecture and high system integration with all key components developed by Liebherr allow the D9812 to achieve a very high efficiency. The intelligent engine control unit (ECU), as well as the common rail 11.5 fuel injection system, are match to each other, providing low fuel consumption. Moreover, this efficient engine is easy to maintain, which maximises its availability, while keeping operating costs low. To do so, Liebherr developed an engine design with superior ergonomics and components within easy reach. Accordingly, parts can be easily exchanged.